1-The patient does not reach the ideal weight. 2-The patient regains the lost weight. 3-The bariatric surgery done failed to cure the diseases the patient suffers from as Diabetes type 2 and hypertension. 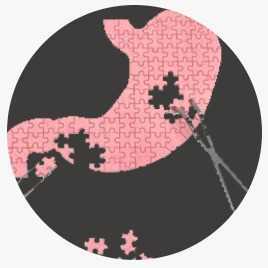 4-The In-perfection of the bariatric surgery done which leads to some complications. 5-The patient needs another bariatric surgery to complete the previous one especially in the very obese patients who do not reach their goal by one surgery. 6-The previous bariatric surgery made to the patient is not the suitable one for him..chosen wrongly. 7-Some complications that may occur after bariatric surgeries such as persistent vomiting, peptic ulcers, Anaemia and mal-absorption of nutrients. 8-Unsuccessful selection of the surgeon. 9-Stretching of the stomach as a result of not following the post-operation instructions. 10-Lack of commitment to diet and new lifestyle after the operation sometimes is the main reason for the failure of bariatric surgeries. -The most corrected bariatric surgeries are the old stapling of the stomach and the gastric belt, and the laparoscopic gastric bypass is done to correct these processes. We do not recommend gastric sleeve operations to correct previous unsuccessful bariatric surgeries. -The failure rate in some bariatric surgeries is higher than others such as gastric stapling and gastric belt. Other surgeries are associated with very high success rates such as gastric bypass and gastric sleeves surgeries. -The probability of complications from the Redo bariatric surgeries such as leakage and others is higher than the first surgery done and the expected results in weight loss are less than the first surgeries. -Dr. Ahmed EL Masry, the consultant of bariatric surgeries and endoscopy and the specialist in the Redo bariatric surgeries,confirms that the patient has a major role in the success of bariatric surgeries and reaching the ideal weight safely without any complications, by following the instructions and advice after the operation accurately and regular follow-up With the doctor. Of course, the bariatric surgeon has the main responsibility for the success of the surgery, taking all the necessary precautions and considerations for the success of the surgery and passing with the patient in peace without any complications. 1-The leakage test in the operating room before completing the process to check that there is no problem with staples or any possibility of leaking. 2-Avoiding the occurrence of clots by giving the patient injections and making the patient wear a compression bandage and urging him to move after two hours of operation. 3-Using the most updated and efficient types of surgical instruments and the use of the most modern American staplers now worldwide. Also following the quality and safety standards before and during the process to ensure that no infection occurs. Redo bariatric surgeries requires special precision and experience which is guaranteed by DR.Ahmed EL Masry.